The Cherry Chipotle BBQ Sauce says right on the bottle that is “Good Enough to Drink”. They’re right, that is some good stuff. As a special treat we were given some of Lumberjacks new “Lumber Jill” Italian Blend garlicwood pellets adding a nice smoky garlic flavor to our chicken wings. I smoked them for an hour. Very nice, you have got to try these. In medium bowl, mix all ingredients. Refrigerate at least two hours to blend flavors. 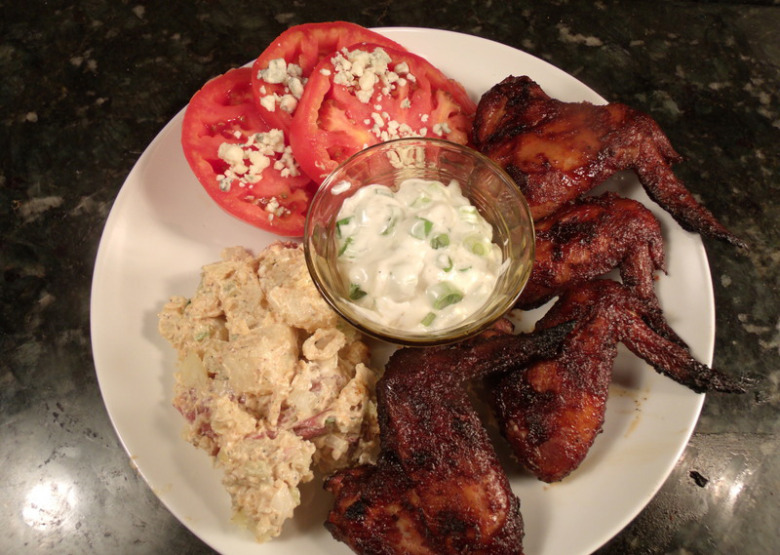 Give your wings a nice dusting of Green Mountain Grills Roasted Garlic Chipotle Rub, then onto the Green Mountain Pellet Grill. I like to let them sit in the smoke for 30 minutes or so. Just enough to pick up some of that good smoke flavor. You can skip this part if you are hungry, but you’ll miss out on some fine flavor. Then, I grill them at 350 degrees (180c) for 30 minutes or so until I reach an internal temp of 165 degrees (74c) (USDA) I like 180-190 degrees (80-90c) better. The meat flakes apart real nice at 190 degrees (87c). The last 15 minutes or so I use a brush my sauce on them, flip them and sauce the other side. Then every 5 minutes I give another coating of sauce. I like to smoke everything for at least 30 minutes with an hour being even better. After all theGreen Mountain Wood Pellet Grill is an awesome smoker so use it for all the wood smoke flavor it will add to your food. So after the grill comes up to temp and burns clean turn it back down to 180 degrees (87c). Place everything directly onto the grill and just let it hang out in the smoke and get happy for 30 minutes or so. This is referred to as “Smoking” or “Hot Smoking”, the temperature is 180 degrees (87c). 30 minutes of smoking is not enough to have any cooking effect on your wings but it is enough to open the pores so that they can pick up all the flavor of the smoke. After 30 minutes, turn the (Feed Control) up to 350 degrees (174c) for about 30 minutes. You are looking for an internal temp around 180 – 190 (90c) pull them off, cover and let it rest for a few minutes before serving. Note: I get a lot of questions about the kind of pellets you can use with a recipe. Keep in mind that a recipe is just an outline. Some you need follow closely like when you are making bread, but most you can do anything you can dream, our favorite way to cook. Feel free to mix and match the pellets until you find a combination you really like. Also you are only smoking at temps less than 250 degrees, anything higher is cooking and there will not be much if any smoke so it does not matter what kind of pellet you are using. It is the same thing, time and temperature is what it is all about. The Green Mountain grill is just like your oven except it uses wood pellets and has wheels. I can’t wait to try the wings.